I typed and formatted the quote in Photoshop, printed on cardstock, then put it into a frame that I already had in one of my many 'picture frames that have yet to be hung or displayed around the new house' boxes! 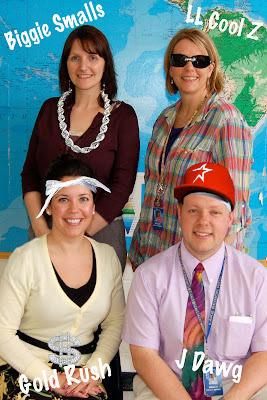 ...that's one good-lookin' group of teachers right there! Ahh, the beauty of Photoshop! Anyway, I digress...my point is that I decided to make them each a copy of the quote. I used these cool plastic picture sleeves with magnets on the back so they can put them on the side of a file cabinet, if they so choose. I already had the sleeves in the aforementioned 'photo frame box' so the total cost of the project was $0!